Politico reports that Jeb Bush will endorse Ted Cruz on Wednesday, a move that comes just 32 days after Jeb! dropped out of the presidential race. Bush underperformed against the likes of Cruz, Trump, and Marco Rubio, who has also since dropped out and probably could have benefited from a Bush endorsement. In a statement that will be released by the Cruz campaign Wednesday, Bush said, "Ted is a consistent, principled conservative who has demonstrated the ability to appeal to voters and win primary contests." For the sake of our party and country, we must move to overcome the divisiveness and vulgarity Donald Trump has brought into the political arena, or we will certainly lose our chance to defeat the Democratic nominee and reverse President Obama's failed policies. 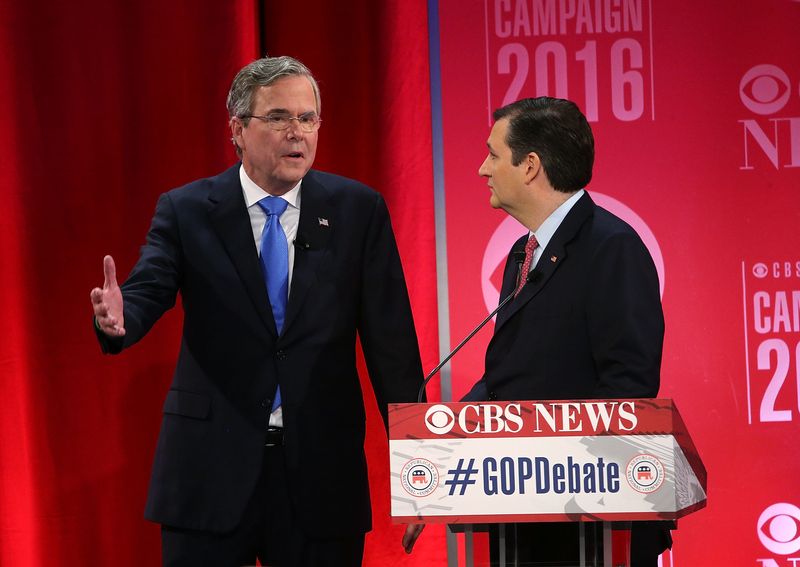 Bush was one of the first to go after Trump in the Republican debates. Things turned nasty in February when Bush mocked the idea of Trump being president. Trump had long been particularly rough on Bush, calling him "low-energy." As far as endorsing Rubio, a Republican insider told Politico that Bush didn't think he was up for the job of president. That has to sting, as Bush was once Rubio's mentor. The New York Times reported that Bush met with all of his former opponents before making a decision. Republicans had held out support for Cruz until just recently. Former presidential candidate Mitt Romney said that he voted for Cruz in the Utah caucus. Even Sen. Lindsey Graham has endorsed Cruz, and said he would stump for the Texas senator. Of the choice between Trump and Cruz, Graham had previously said, "It's like being shot or poisoned. What does it really matter?" Now he'll do whatever he can for Cruz now that Trump is so close to taking the nomination. It might be too late to fend off Trump, though. He won the winner-takes-all state of Arizona on Tuesday bringing his delegate count to 739, according to the Associated Press. That's not meeting his targets as measured by FiveThirtyEight, which says he needs to be at 789 after Tuesday's races — but it's much better than Cruz's 465 or Kasich's 143. Cruz made the rounds on talk shows Wednesday morning citing the Bush endorsement as a further sign that the Republican party is uniting around him. That's what Bush says needs to happen anyway if the GOP wants to win. He said in his statement, "To win, Republicans need to make this election about proposing solutions to the many challenges we face, and I believe that we should vote for Ted as he will do just that." Now to see if the American voters agree.